An excavated site, The Pnyx is a small rocky hill with steps carved on its slope. 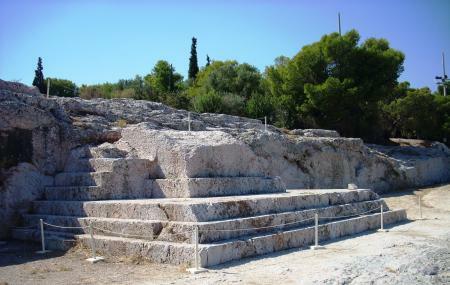 Having a historical background, the Pnyx was the official meeting place of the Athenian democratic assembly (ekklesia). Complete with a speakers’ platform carved from stone and a seating capacity of around 8000, the Pnyx now attracts tourists because the view from the top is magnificent.According to the archaeological survey, it is ascertained that Pnyx had three main building periods. The first period saw the use of natural hillside as the cavea of the theatre. The second period saw the arrangement of the auditorium with to support an embankment sloping down to the south. The Pnyx of the third period carried out the same project at a larger scale with the construction of large stone blocks quarried from the area. Although there is a lot of historicity attached to this site yet the place is stupendous in in its natural beauty as well since it offers beautiful views of the city and landscape around. People normally club together Choragic Monument Of Lysicrates and Byzantine Museum while planning their visit to Pnyx. Very nice green hill in the center of Athens, near archeological sites. Great historical site, you can get right up next to the speaker's platform in the heart of where western democracy was created by Cleinthenes in the spirit of the 2nd generation of philosophers (do read up on all the innovative ways he broke up tribalism, feudalism, money in politics, et.al.). Breath-taking views of the city and Acropolis. If you are a lover of political theory, democracy, Greek philosophy, etc, visit this space and picture the weekly meeting of the citizenry to approve or deny the laws created by the elected representatives.